When most mystery fans think of a detective, Sherlock Holmes is first on their list of master sleuths. Sherlock Holmes is, of course, the creation of Sir Arthur Conan Doyle. Holmes appeared in 60 stories written by Doyle and published from 1887 until 1927. Readers were introduced to the quirky mind of Holmes in A Study In Scarlet, first published in England in Beeton's Christmas Annual in1887. The narrative opens with the reminiscences of John H. Watson, M.D., late of the Army Medical Department. Dr. Watson explains that he had found himself in London, weak with pain from a war injury he suffered while stationed with the Fifth Northumberland Fusiliers as Assistant Surgeon during the second Afghan war. Struck on the shoulder by a Jezail bullet, the wounded Dr. Watson is dispatched home to England, and "without kith nor kin" and only a small allowance to sustain him, the good doctor is desperate to find affordable lodgings. Introduced to Sherlock Holmes by a mutual friend, the affable Dr. Watson soon agrees to share lodgings with his new acquaintance. Once settled in to their rooms at 221 B Baker Street, however, Watson discovers that his roommate has some remarkable powers of deduction and some very strange personal habits and varied interests, as well. Holmes, it seems, is a chemist, violin player, amateur boxer and swordsman and a consulting detective! He keeps his pipe tobacco in a Persian slipper, practices his marksmanship inside the flat, and when his mind is not engaged on a puzzling mystery, Holmes will indulge in cocaine to 'feed' his brain with drug-induced stimulation. Sherlock Holmes solves mysteries by deductive reasoning and keen observation. He can identify even the most minute clue from a grain of ash dropped from a cigar at the scene of a crime to the occupation of a suspect by a scuff on his shoe. 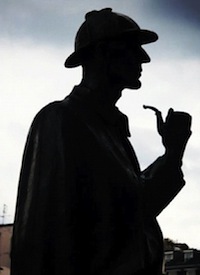 Dr. Watson, as well as all who hear Holmes' amazing deductions seem somewhat let down when they discover the logic behind the detective's reasoning. Of course, Holmes himself always insists that the solution to the problems he is given are simply, "Elementary." Holmes is a loner and a social outcast in many ways. Although he has a brother, Mycroft, who occasionally appears in the stories, his personal life seems wanting for emotional connections with family and friends. Yet, Holmes and Dr. Watson develop a firm friendship that spans decades. While Watson later moves on to marriage with his wife, and later a second wife after he is left a widower, his relationship with Holmes endures. Whenever he shows up at his old digs on Baker Street, the landlady, Mrs. Hudson, greets him with a ruddy smile and when he bounds upstairs, Holmes inevitably lures him into working on another case. Sherlock Holmes first appeared in magazines and then in longer novels which captured the imagination of mystery fans all over the world. Holmes later appeared on the stage, in radio dramas, movies and on television. The most well known duo to play Holmes and Watson were actors Basil Rathbone and Nigel Bruce. The two took on their roles in dozens of movies and on radio for many years. Other actors who have stepped into the role include Peter Cushing (in the first Sherlock Holmes movie filmed in color), Roger Moore, Ian Richardson, and Christopher Lee. Current mystery fans might prefer the hauntingly accurate portrayal of Holmes by Jeremy Brett. Brett brilliantly captured the essence of mystery and even the achingly lonely genius of Holmes in the 36 episodes and 4 films he starred in from 1984 to 1994. He also managed to infuse a sense of dry humor into the character which was also present in the original stories. Two actors, David Burke and Edward Hardwicke took on the role of Dr. Watson opposite Brett's Holmes. An interesting bit of trivia is that Brett also played Dr. Watson in a stage production opposite Charlton Heston, as Holmes in 1980. Visitors in London will want to stop in for a pint of their favorite beverage at the Sherlock Holmes Pub, 10-11 Northumberland, London. The bar is decorated with an extensive array of Holmes memorabilia. Holmes and Watson surely live on in the hearts of mystery fans. They epitomize a genre of mystery that is almost nostalgic. In their Victorian simplicity, evil is all around but good always triumphs. Aaaah, if only the problems of today's world were so easily detected and solved. Read our biography of Sir Arthur Conan Doyle. Read our review of The Hound of the Baskervilles.